We have a confession to make. There are more than seven reasons to cruise to Alaska. In fact, there are too many reasons to count, or at least to write about in a blog post. Alaska is one of the most exciting and compelling travel destinations in the United States. It also happens to be a favorite destination with cruisers. But sticking to the coastline, as beautiful as it may be, won’t give you a complete picture of The Last Frontier. That’s why we can’t wait to bring our immersive approach to travel to this part of the world. 1. Land and Sea Packages deliver the best of both worlds. Alaska’s beautiful, rugged coastline lends itself well to cruising. But what about its wild heart? Easy – venture inland before or after your cruise with our Land and Sea Packages. And the best part is, all the details are handled for you. Why DIY when you can leave it to us? Girdwood, home to the Alyeska Ski Resort, is a small town with a relaxed-luxury atmosphere and boast-worthy surroundings. Mountains and glaciers encircle the town and are best viewed by taking the tram up Mount Alyeska. A visit to this sanctuary for orphaned and injured animals is going to tug at your heartstrings. While there, you might see bears, bison, wolves, foxes, lynxes, moose, and more. This domed train is one of the best ways to get around in inland Alaska. It will take you to some of the state’s most charming towns, like Talkeetna and Fairbanks. Also on the Wilderness Express’s route is Denali National Park. The pride and joy of Alaska, the national park is famous for the towering Denali (formerly known as Mount McKinley). At over 20,000 feet high, the sheer size of the mountain is something to marvel at, and on clear days the vistas are simply stunning. 2. Eleven Alaskan cruise ports will knock your socks off. Now that we’ve covered the incredible inland experiences you can have in Alaska, let’s discuss the main event: your cruise! We’re calling on 11 different Alaskan cruise ports that cover the breadth of what this massive, magical state has to offer. There’s Alaska’s sophisticated, yet mind-bogglingly-remote capital city of Juneau. No roads lead to Juneau, which of course doesn’t prevent it from being a picture-perfect cruise destination. The city is small but boasts enough restaurants, breweries, and activities to make it quite an attraction. It’s most famous for the nearby Mendenhall Glacier, a gorgeous ice floe that really needs to be seen in person to be appreciated. There’s plenty of hiking opportunities at the glacier, as well as a Visitor Center. Our boutique cruise ships cruise to smaller ports too, ones that mega-ships simply can’t access. One of them is Sitka, a hidden gem on Baranof Island in Alaska’s Inside Passage. This unique city offers an intriguing mix of indigenous and Russia history, as it is the ancestral home of the indigenous Tlingit people and once served as the capital of Russian Alaska. 3. Your Alaskan cruise could call on Seattle and Vancouver, too. Our range of Alaskan cruise itineraries make it easy to find the perfect voyage for you. Our itineraries include other favorite North American ports like Vancouver and Seattle. Want to know how you should spend your time there? We've got some tips! Learn about Indigenous culture at the Museum of Anthropology at UBC. You’ll be able to see amazing art, carvings, and weavings from the Northwest Coast First Nations people. Stroll the Stanley Park Seawall Trail. The nearly nine-kilometer trail serves up incredible water and mountain views on one side, and lush forest views on the other. Expect it to take three or so hours to walk the entire trail. Grab some grub in Gastown. The cobblestoned old town is home to heritage buildings that now house trendy restaurants and boutiques, and the nearby Chinatown neighborhood is one of the largest in Canada. Visit the covered market and more on Granville Island. The “island” is actually a peninsula, but most access it via a ferry from downtown Vancouver. Granville Island’s main attraction is a large public market, but its restaurants, shops, microbreweries, and more make it a charming place to explore. Browse cruises calling on Vancouver, British Columbia. Visit the Pike Place Market. This eclectic market dates back to 1907 and, today epitomizes Seattle’s famously unique – and dare we say, hipster, – culture. It runs from 9:00 a.m. to 6:00 p.m. Monday through Saturday, and until 5:00 p.m. on Sundays. Get caffeinated. There’s more to Seattle’s coffee culture than Starbucks. Elm Coffee Roasters, Peloton Bicycle Shop & Café, and Milstead & Co are a few indie favorites. Nerd out at The Museum of Pop Culture. This hip museum is where stellar architecture meets music geekery. There are permanent exhibits on the history of rock and roll (with a welcome local bias towards Hendrix and 90s grunge) as well as temporary exhibits on topics like sci-fi and comic books. Take the ferry to Bainbridge Island. Seattle is famous for its ferryboats, and a ride on one is the best way to get out on the water and take in that gorgeous city skyline. Tiny Bainbridge Island is a charming place to visit, and only a 35-minute trip across the bay – well worth it. Browse cruises calling on Seattle, Washington. 4. We’ll take you on an unforgettable Alaskan adventure – if you’re up for it. Pristine and rugged, Alaska is beloved for its incredible scenery. The state’s awe-inspiring glaciers, fjords, snowcapped mountains, and rainforests make it one of the most picturesque destinations on earth. To truly experience Alaska you must fill your lungs with its fresh air, gaze upon its stunning vistas, and listen to the sounds of its gushing waterfalls. Alaska is a must-visit destination for adventure lovers. The opportunities for thrilling experiences are endless here. Beginning with a quintessential Alaskan excursion, dog sledding. In Juneau, you can go dogsledding on the famous, nearby Mendenhall Glacier or take an exhilarating helicopter ride to experience dogsledding at the more remote Norris Glacier. The views as you soar over the area’s jagged mountains and glaciers will simply take your breath away. Once on the ground, you’ll get to meet about 300 Alaskan huskies. Whether you take the reins yourself or opt for a jaunt in the sled, you’re in for the ride of a lifetime. It doesn’t end there. Imagine, soaring from the summit of Skagway’s White Pass on a bicycle, taking in a picturesque landscape of glaciers and mountains along the way. 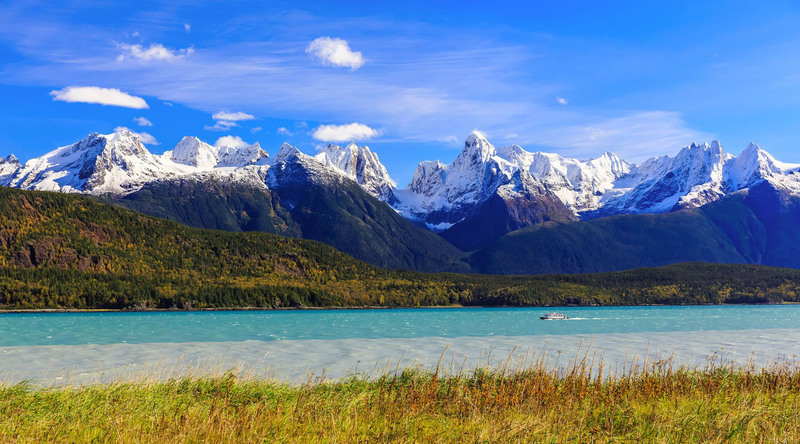 Or, if that doesn’t sound your speed, picture yourself relaxing on a riverboat in Haines, Alaska, as you take in the natural beauty of your surroundings. Your odds of spotting a bald eagle are good, and you might even see moose or bears as well. Or, are you after the ultimate Alaskan souvenir? In Icy Strait Point, head out on the water for a halibut fishing expedition – you can have your rewards shipped home to enjoy. Our Cruise Global, Walk Local shore excursion in Icy Strait Point will help you gain a more profound understanding of Alaska’s natural wonders and what makes this destination so special. After exploring the area with a local guide, you’ll come to appreciate the deep connection native Alaskans have to this land. Have we piqued your interest yet? You can browse all our Alaskan shore excursions here. 5. Your taste buds are in for an adventure, too. Salmon. Coldwater seafood is at the heart of Alaskan cuisine, particularly salmon. You’ll find it served in a myriad of ways – baked, smoked, cured, grilled, and more. Crab. Dungeness and King crab are both popular in Alaska, and partaking in a good old-fashioned crab feast is a must when you’re there. Fresh-caught crab is served with clarified butter and an assortment of side dishes. You can’t go wrong by dining on crab cakes, bisques, buckets of crab, or any other iteration of the food, either. Halibut. Halibut isn’t as synonymous with Alaska as salmon or crab, but it is plentiful. It’s a versatile white fish that lends itself well to a variety of dishes, including fish and chips. Game meat. Hunting is popular in Alaska, and you’ll find the results on menus across the state. Reindeer sausage, caribou steak, and bison burgers are dishes to look out for. Blueberries. Alaska’s famous wild blueberries are in season during late summer and make an appearance in pies, cobblers, and other delicious desserts. 6. Experience it all from a boutique hotel at sea. Cruising isn’t just easy (although, that’s certainly one of the perks). It’s simply a more pleasurable way to travel. No one wants to haul their luggage across America’s largest state, coordinating a complex mix of trains, planes, and automobiles to get from Point A to Point B. That’s no way to relax. When you cruise with Azamara, the vacation experience doesn’t pause when you leave a destination. Your travel time, those hours spent getting from one place to the next, become one of the highlights of your trip. You’ll enjoy incredible onboard dining, meet new friends, and sleep well in an elegant suite or stateroom. You’ll still get that adventurous, rugged Alaskan experience, but with a refined twist. 7. You’ll make memories to last a lifetime – and will have the incredible vacation photos to prove it. The most important item to pack for your Alaskan cruise? A camera! After all, when you travel to one of the most photogenic places on earth, you want the Instagrams to show for it. From Juneau’s stunning glacier to the Misty Fjords and waterfalls of Ketchikan, the spectacular scenery of The Last Frontier will be a highlight of your voyage. To make sure you capture it well, read our article “Ten Tips for Taking Incredible Vacation Photos in Alaska”. From nailing those quintessential vacation selfies to snapping the perfect wildlife photo, these ten tips will help make sure you return from your Alaskan cruise adventure with a photo album that lives up to your memories. Are you ready to start planning your Alaskan adventure? There’s no better way to cruise to Alaska than with Azamara Club Cruises. Click here to browse itineraries. Adventure Is Calling. Will You Answer?